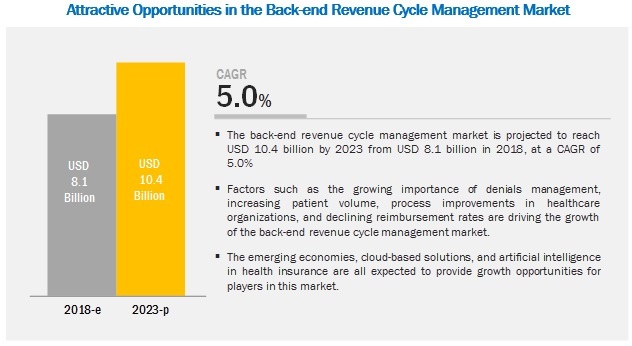 [136 Pages Report] The back-end revenue cycle management market is projected to reach USD 10.4 billion by 2023 from USD 8.1 billion in 2018, at a CAGR of 5.0%. Factors such as the growing importance of denials management, increasing patient volume, process improvements in healthcare organizations, and declining reimbursement rates are driving the growth of the market. However, the high cost of deployment, integration of back-end revenue cycle management solutions, data breaches and loss of confidentiality, and lack of skilled IT professionals in healthcare are expected to limit market growth to a certain extent in the coming years. On the basis of product & service, the back-end revenue cycle management market is segmented into software and services. The services segment is estimated to witness the highest CAGR during 2018–2023. The high growth of this segment is primarily due to the recurring nature of services such as training and development, installation, software upgrades, consulting, and maintenance. By software, the market is broadly segmented into integrated and standalone software. In 2018, the integrated software segment is expected to account for the largest share of the back-end revenue cycle management market. The large share of this segment can be attributed to the ability of integrated solutions to help users to streamline and coordinate multiple financial functions through a single platform. By end user, the market is segmented into healthcare payers and healthcare providers. In 2018, the healthcare payers segment is expected to account for the largest share of the market. Insurance providers need to comply with various federal and regional laws and regulations. Many of these regulations have privacy and security concerns relating to patient information and strict auditing and reporting requirements. With the help of back-end revenue cycle management solutions, insurance providers adhere to regulatory requirements and reduce unnecessary penalties and punishments. The growing stringency of regulations for payers is thus driving the adoption of back-end revenue cycle management by healthcare payers. Geographically, the North American market is expected to account for the largest share of the market in 2018. The large share of North America in the market can be attributed to factors such as growing HCIT investments in the region, the presence of regulatory mandates supporting market growth in the US, and increasing digitalization and favorable funding initiatives by the Canadian government. athenahealth (US), Cerner Corporation (US), Allscripts Healthcare Solutions, Inc. (US), eClinicalWorks (US), Optum, Inc. (US), McKesson Corporation (US), Conifer Health Solutions (US), GeBBs Healthcare Solutions (US), The SSI Group (US), GE Healthcare (US), nThrive (US), DST Systems (US), Cognizant Technology Solutions (US), and Quest Diagnostics (US) are the key players in the back-end revenue cycle management market. McKesson is one of the major players in the market. To sustain its leading position in the market, the company focuses on deploying products in various hospitals and institutes. In line with this, during 2016–2017, the company deployed its products at various healthcare organizations in the US, some of which include Oregon Advanced Imaging (US), Emergency Recovery (US), and the Orthopedic Institute of Wisconsin (OIW) (US). Optum provides a variety of back-end revenue cycle management solutions and facilitates the complete lifecycle of claims processing, eliminating multiple systems and inefficient processes. The company focuses on partnerships and product deployments to enhance its presence in the market. The OptumInsight segment helps healthcare payers and providers to improve performance; achieve efficiency; reduce costs; advance quality; and meet the compliance mandates of hospital systems, physicians, health plans, governments, life science companies, and other organizations. What are the upcoming back-end revenue cycle management software solutions? Which of the product segments will dominate the back-end revenue cycle management market in the future? Emerging countries have immense opportunities for the growth and adoption of back-end revenue cycle management solutions. Will this scenario continue in the next five years? Where will all the advancements in products offered by various companies take the industry in the mid to long term? The study involved four major activities to estimate the current market size for back-end revenue cycle management. Exhaustive secondary research was done to collect information on the market and its different subsegments. The next step was to validate these findings, assumptions, and sizing with industry experts across the value chain through primary research. Both top-down and bottom-up approaches were employed to estimate the complete market size. Thereafter, market breakdown and data triangulation procedures were used to estimate the market size of segments and subsegments. In the secondary research process, various secondary sources such as Hoovers, D&B, Bloomberg Business, and Factiva have been referred to so as to identify and collect information for this study. These secondary sources included annual reports, press releases & investor presentations of companies, white papers, certified publications, articles by recognized authors, gold-standard & silver-standard websites, regulatory bodies, and databases. After arriving at the overall market size using the market size estimation processes as explained above the market was split into several segments and subsegments. In order to complete the overall market engineering process and arrive at the exact statistics of each market segment and subsegment, data triangulation and market breakdown procedures were employed, wherever applicable. The data was triangulated by studying various factors and trends from both the demand and supply sides in the back-end revenue cycle management industry. Athenahealth (US), Cerner Corporation (US), McKesson Corporation (US). Major 10 players covered. This research report categorizes the back-end revenue cycle management market based on product & service, delivery mode, end user, and region.